Patience has never been a virtue of mine. At the moment I’m struggling with my lack of it. I’ve (sort of) finished up at work, and one would assume that would give me lots of free time. Not so. This week I’ve been really busy. I had a (very welcome, by the way) visit from a friend, yoga classes, a brother’s 21st present to finish making, cooking, movies, The Decemberists concert, a night at the Moonlight Cinema. My brothers and some friends were over for dinner on Thursday night, excited about the Big Day Out they were going to be sweating at the following day, then my parents came up to Sydney and I had dinner with them and my aunt, uncle and cousins before we headed off to Foster on Saturday morning for a family holiday. I’m currently lazing about drinking cider and eating cheese and biscuits, so I can hardly complain, but I’m beginning to wonder if I’ll ever start with the writing. And I’m getting frustrated. 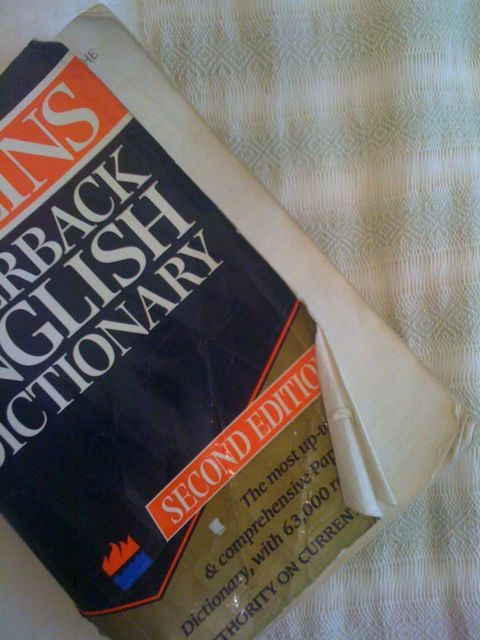 On a side note, I picked up this second hand dictionary the other day from some cute kids selling some things outside their house. They told me I looked like I was in high school. Bless. Small salespeople in the making, methinks! One can never have too many dictionaries. This entry was posted in Uncategorized and tagged patience, work, writing, yoga sites i like by avocadoandlemon. Bookmark the permalink.